You're Here: Home / Blog / Digital Signage / The Cost of Customer Acquisition. Recently I wrote some pieces about our recommended reading list. One of the books was about Inbound Marketing specifically HubSpot. During that article I talked about how we had to re-engineer the company from a company selling Enterprise level software to one selling SaaS solutions and I talked about the cost of customer acquisition and how important this is to the strategy of any company. Well I thought that this is so important to any company whether starting up or ‘re-engineering’ itself. I will cite two excellent articles and provide the links if people wish to ‘dive’ further into this subject. When looking at your sales line you should also look at the what the cost of acquiring your customers is. Clearly a customer who provides £1,000 of revenue but who costs £1,001 to acquire (The micawber principle if you like) is not a good bet. However to do this you need to know the CAC (Cost of Customer Acquisition) and the LTV (Lifetime value) of the customer. 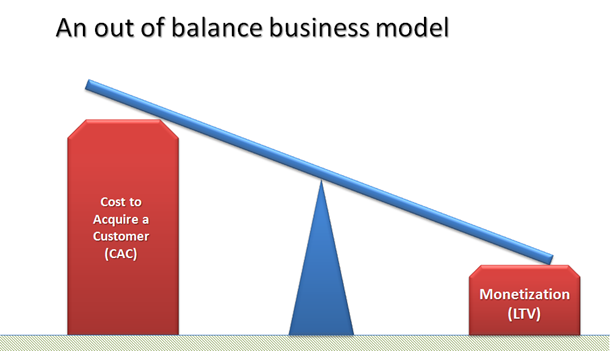 It doesn’t take a genius to understand that business model failure comes when CAC exceeds LTV. 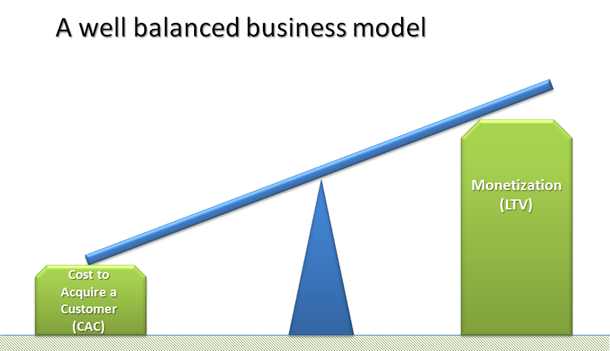 Hardly rocket science but the goal is give the reader a sense of the balancing act required to create a profitable business. So on the face of it if your CAC is higher than your LTC you need either a more cost effective sales/marketing model or more lucrative customers. The idea of a £0 line sales and marketing model that gets customers with £1m+ LTV is clearly living in cloud cuckoo land so where do you start? Well you can start by looking at the various levels of sales complexity. Here you drive traffic to the web site using SEM/Pay per Click ads, SEO, Inbound Marketing, Freemium, etc. Visitors convert to paying customers without any need for salespeople. The product needs to be simple to understand, and have a compelling value proposition. In this model, you might provide some light level of human touch such as email exchange to answer questions and provide customer support. A slightly higher level of touch might involve a phone call with an inside sales person. Here you still sell your product/service over the phone, but the amount of work in closing the deal requires several phone calls, sales engineers, and/or web-based demos. Now you require an on-site visit using a field sales organization. You might also need multiple on-site visits, selling to several decision-makers, use of SE’s (sales engineers), and perhaps on-site proof-of-concept installations that take considerable SE time. Obviously the Freemium model is the least expensive and they progressively move more expensive finishing with the Field Sales with Sales Engineer model (ask IBM if you don’t believe me). Also it is worth noting that companies very rarely fit into just one of these categories but rather straddle a few. For example when the main stream business of Dynamax was selling Enterprise level software we straddled High Touch Inside Sales through to Field Sales with Pre Sales Engineers, but this was clearly the wrong model for a SaaS operation so we now straddle No Touch Self Service through to High Touch Inside Sales as we have a wider variety of customers now from ‘Doris the Florist’ who has one screen through to large organisations that have many hundreds. Each of these client types call for a different level of customer engagement so be prepared for that (while of course still looking at the LTV/CAC ratio). This entry was posted in Digital Signage, Infographics, Marketing and Advertising, Tips and advice, Uncategorized and tagged #avtweeps, #digitalsignage, #proav, cloud based digital signage, digitalsignage.NET by hsmith. Bookmark the permalink.